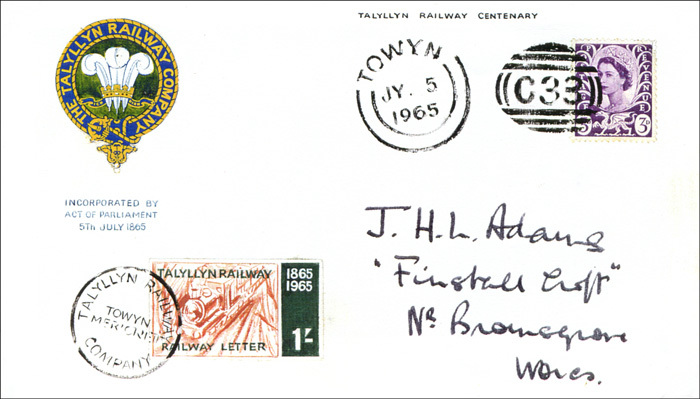 Rather than tell the wider story of Railway Letter Stamps after 1950 (the so-called Modern Railway Letter Stamps), we will instead look only at the Talyllyn Railway, concentrating on how the 1965 Centenary first day cover was produced. The Talyllyn Railway (TR) was opened in 1865. It is a 2 foot 3 inch narrow gauge railway, and runs from Tywyn to Nantgwernol – over 7 miles, but just short of Talyllyn itself. Its main function was to carry slate from the quarries at Bryn Eglwys to Tywyn. Despite serious problems caused by under-investment it continued to run as an independent railway through both the 1923 Grouping of the Railways and the 1948 Nationalisation of the Railways. In 1951 it became the first railway in the world to be preserved by volunteers as a Heritage Railway. From a railway philately viewpoint, our interest starts in 1957 – when the Tallyllyn Railway became the first ‘modern’ railway to produce sheets of letter stamps. These stamps were quite unlike earlier ‘old-style’ letter stamps in that they were multi-coloured and had pictures of engines on them. The sheets were re-issued the next year, over-printed 1958. It was decided to produce a Centenary first day cover for 1965, and work on this started by making a mock up or draft of the cover. First, a draft was prepared. The process of setting up a draft started with a pencil sketch (left) by Terence Cuneo. 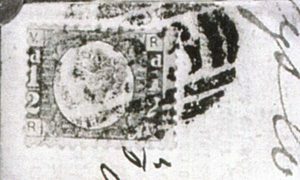 To assist with the design work, a stamp-sized bromide (photograph) was made of the drawing. From this copy, seven watercolour ‘roughs’ the size of the required stamp (40 x 23 mm) were prepared by Max Mason F.R.S.A. The seventh colour trial was probably not done at the same time, as it contains the extra text RAILWAY LETTER. This last colour trial was the one chosen for the production of a draft version of the first day cover (shown further below). 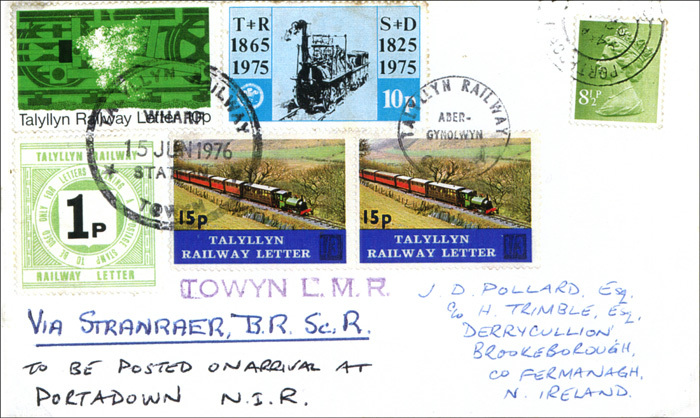 The draft of the first day cover was to show an envelope containing a Post Office stamp (cancelled with a duplex handstamp at Tywyn), and also a Talyllyn Railway stamp (cancelled at Tywyn Merioneth). However, the name Tywyn was to be printed as Towyn because, until about 1950, Tywyn had been better known as Towyn, or Towyn-on-Sea. The G.P.O. was asked for a copy of the Towyn C33 obliterator part of the duplex … but this was missing from the G.P.O. files at the time. 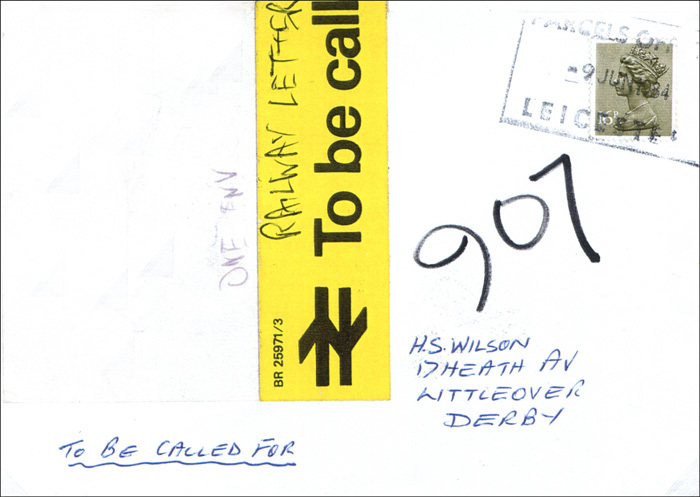 However, Michael Scott Archer was able to produce an envelope with the C33 obliterator on it, and this was copied as part of the Post Office cancel for the draft cover. Some 8,500 copies of the first day cover were printed. 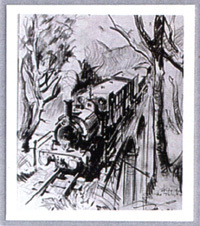 Based on the seventh ‘rough’ image (which included the text RAILWAY LETTER), sheets of Talyllyn Railway 1/- Letter Stamps were printed by Thomas De La Rue. One of these 1/- stamps and a Welsh 3d Post Office stamp were added to each printed cover. All covers were carried from Abergynolwyn to Towyn on the Talyllyn Railway on the morning of 5 July 1965. Each envelope also contained a printed card with a message from L.T.C. Holt, the Chairman of the Talyllyn Railway Company. 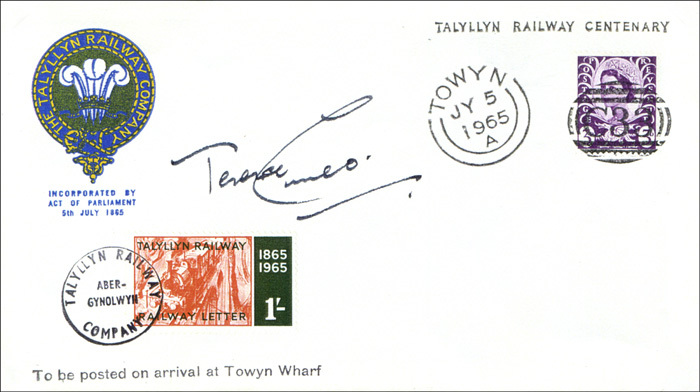 In December 1967, the Preservation Society announced in the Talyllyn News that it had six covers (as below), each signed by Terence Cuneo – on whose drawing the stamps were based. These signed covers were offered for sale, via the railway shop at Wharf Station, for a minimum of 25 shillings per cover.